A classic treat! 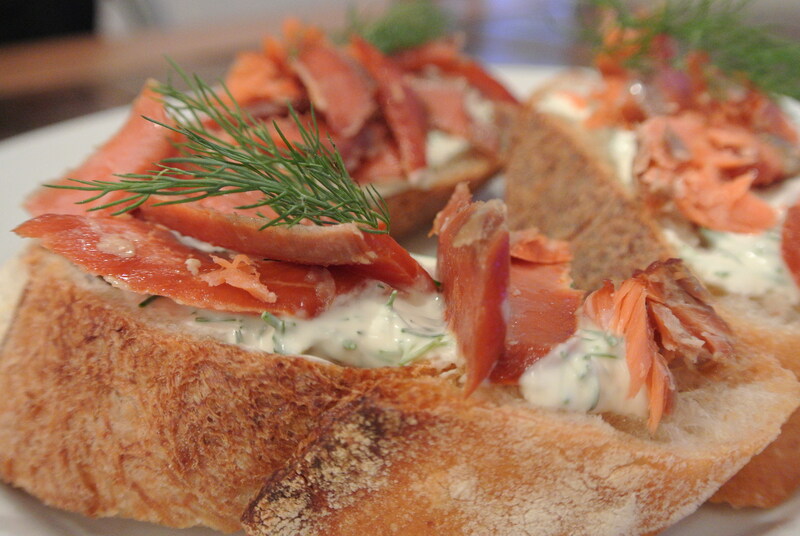 For some reason I had a hankering for smoked salmon and when Mark announced that he was going to host Cigar Night last Tuesday I knew exactly what I was going to prepare…Smoke Salmon Bruschetta. The recipe below basically can be replicated for any type of “vessel” (aka crackers/sliced baguette/mini toasts etc) and is very impressionable- your guests, friends and family are sure to love it! I used mini toasts for the Cigar Night but these photos were taken the day after when I used a Macrina Bakery baguette. First, slice your baguette and lightly toast in the oven (broil) or lay your crackers/toasts out on a serving tray. Mix the creme fresh with freshly minced dill and sprinkle with a bit of salt to taste. Shred the smoked salmon (I tend to like larger bits, but do whatever is your preference) and assemble!